The footage is actually from a July 16 incident, when the MSP had been alerted about a semi-truck driving out of control down Highway 10. 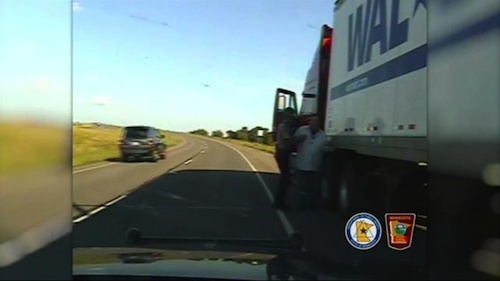 The video shows the responding officer attempting to pull the driver over and the truck dangerously continuing on its path before veering off the road onto the right shoulder, nearly hitting road signs, and then dangerously swerving back into traffic. The truck driver continuous to careen down the highway and almost takes an exit ramp before finally coming to an abrupt stop. Then the video gets even more interesting as the trooper approaches the driver and proceeds with the traffic stop. The trooper says that he immediately noticed the driver's bloodshot eyes, heavily slurred speech and the strong odor of alcohol coming from the cab. When he asks the driver to step out of the vehicle, the man obliges but is so incapacitated that he falls mid-step and lands in a heap at the officer’s feet. Surprisingly, the officer appears to be extremely patient and kind as the heavy-set man crawls around the road in a drunken stupor. Apparently the trooper eventually had to close the right lane of traffic to keep the man safe until he was able to help him to his feet and walk him to the patrol car. 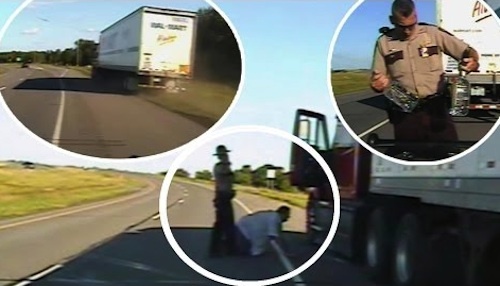 In the video you can also hear the trucker responding to the trooper's questions, saying that his trailer was empty and that he'd only had "a few beers" and there was no alcohol with him in the cab. However, upon searching the truck, MSP troopers found two bottles of Barton vodka tucked next to the driver's seat, one of which had been opened. Most incriminating was that the truck driver blew a shocking 0.28, which is more than three times the legal limit in Minnesota. Commercial drivers are also held to a higher standard with the legal limit being 0.04 while on the job. Not surprisingly, the driver was immediately arrested and charged with two counts of driving while intoxicated. The 46-year old man is from Isle, Minn. and was not employed directly by Wal-Mart, but rather a third-party contractor who subsequently fired him from the job. The man was eventually convicted of second-degree DWI, which is also the second DWI conviction on his record. He was sentenced to one year in jail, (most of which he will spend on supervised probation) and four years of post-sentence probation. Yes he needs to loose his driving privileges for life.. Driving a commercial vehicle with alcohol in the cab open also constitutes Federal cuz he was also considered transportation of that alcohol over state lines too.. Such a careless man that didn't think about his consequences an his actions an what coulda happened..!! Man you really screwed up your life. And this is your 2nd offense? You're lucky you didn't get seriously injured or killed and that you didn't hurt anyone else. Someone please show this man into a Christian based rehab before it is too late! Probably should lose you class A driving privileges until you can be trusted again. Really really dumb sir! Thank God and that trooper for stopping you from hurting anyone!!! You have a serious problem and you need help. Not Christian based. He needs reality not fantasy. Curt Potter, you're a moron. I guess you're an Athiest. You're entire life is a fantasy. Omg license. Is history. Flush. Down the toilet. That liquor. Will do it to u hard.. He will never drive a truck again, rightly so. Wow!!!! Glad he's off the road!! !